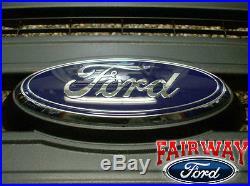 2009 thru 2014 F-150 OEM Genuine Ford Parts Black XL Model Grille w/Emblem NEW. 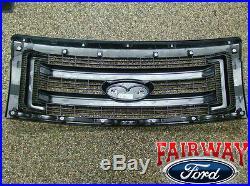 2009 thru 2014 Ford F-150 OEM Black Plastic Grille with Emblem. Add the "Blacked Out" Look to your 2009 - 2013 F-150! Brand New Genuine Ford Parts! 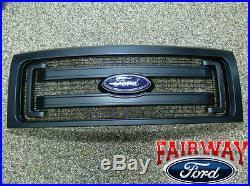 Brand new OEM Genuine Ford Parts black plastic grille complete with center emblem. 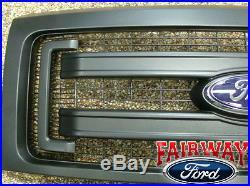 This is the same OEM grille equipped on the 2013 F-150 XL model. Will fit ANY 09 thru 14 F-150! For clarification, this is NOT the "FX4 style" grille with the paintable surround. You cannot take this grille apart and repair a "FX4 style" grille with this grille. This is NOT a cheap overlay! This is the entire grille assembly. Fits all 2009, 2010, 2011, 2012, 2013 and 2014 F-150 trucks (except Raptor). If you are unsure of your application please contact me with your VIN (vehicle identification number). 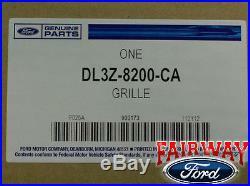 Brand new Genuine Ford Parts! This is a Genuine Ford Brand Accessory designed, engineered, and built specifically for your Ford truck. Ford has made every effort that their Genuine Accessories are top quality in terms of fit, finish and ease of installation! We Go The Extra Mile For Our Customers! If you have any questions please feel free to contact me! Fairway, It's Not Just A Name. That's The Way We Do Business! Please keep this in mind when attempting to contact me. We strive for excellent customer service! UPS Next Day Air and 2nd Day Air service is available at a discounted rate. We accept all major credit cards. The item "2009 thru 2014 F-150 OEM Genuine Ford Parts Black XL Model Grille withEmblem" is in sale since Monday, November 24, 2014. This item is in the category "eBay Motors\Parts & Accessories\Car & Truck Parts\Exterior\Grilles". The seller is "fairfome" and is located in Canfield, Ohio. This item can be shipped to United States, Canada, United Kingdom, Denmark, Romania, Slovakia, Bulgaria, Czech republic, Finland, Hungary, Latvia, Lithuania, Malta, Estonia, Australia, Greece, Portugal, Cyprus, Slovenia, Japan, Sweden, South Korea, Indonesia, Taiwan, South africa, Thailand, Belgium, France, Hong Kong, Ireland, Netherlands, Poland, Spain, Italy, Germany, Austria, Israel, Mexico, New Zealand, Philippines, Singapore, Switzerland, Norway, Saudi arabia, Ukraine, United arab emirates, Qatar, Kuwait, Bahrain, Croatia, Malaysia, Brazil, Chile, Colombia, Costa rica, Panama, Trinidad and tobago, Guatemala, Honduras, Jamaica.